The Trebuchet offers an ultra flexible, hand braided litz of stranded 99.99997% pure ohno continuous cast copper wire (UP-OCC) in an attractive clear dielectric. This unique wire is custom made for Zynsonix Audio, you won't find it anywhere else. Featuring an optimal strand count that delivers exquisite detail and neutrality, it's perfect for headphones, home and portable cables. 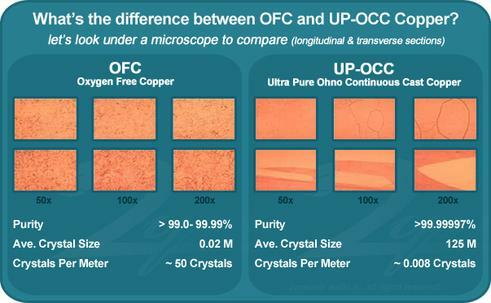 So what's so special about UP-OCC, and what makes it better than good old fashioned OFC copper? UP-OCC has a nice, long grain structure, which you can see below, it's also more pure, which ensures less impurities between you and your music. You can have the Zynsonix Trebuchet wire built into interconnects, headphone cables, and just about anything else you can think of. Feel free to contact for quote. 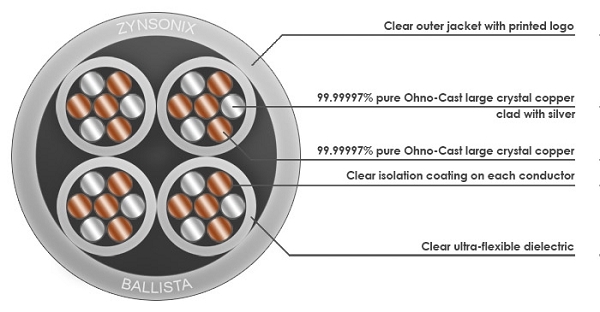 The Ballista is Zynsonix's finest cable, offering a star quad configuration in an ultra flexible jacket clear jacket. It features twenty-eight individually isolated litz conductors, all of which are 99.99997% pure ohno continuous cast large crystal copper wires, twelve being silver clad. This unique wire is custom designed by Zynsonix Audio and made to deliver every detail of the music to your ears in the most balanced and natural way possible.